promo code “3yrs” to access the 30% discount when ordering. FXVM is online since 2013 and have office in USA/UK. They are stable company and we predict to have good future. This company can give you a lot of good conditions about your forex trading account. It is very important the traders to feel good and safe when they trade, so this company will give you this. You can trade forex, stocks or whatever you want. You can use their Lite PLAN and you will have 22GB storage (RAID10). You can trade with 1-2 MT4 platform accounts and Unlimited expert advisors. So you can trade with your system or to use ea and this vps will be good for you. Best for Heavy Usage, so if you plan to be stable, that is the best planfor our opinion. You will have 50GB storage and up to 10 MT4 accounts. Platinium plan is the king and is perfect if you have company. You can try the trial version first and you will see how FXVM work. That is the most important part, to see how your partners work with you and that the money is always deserved. Dont remember that you can make money when you invest money, so that is very important for your trading future. You can use payment options like PayPal, credit cards, Skrill (Moneybookers), Payza, WebMoney, Dwolla and also Bitcoin. Try the VPS trial version first and then you will decide what is the best plan for you. 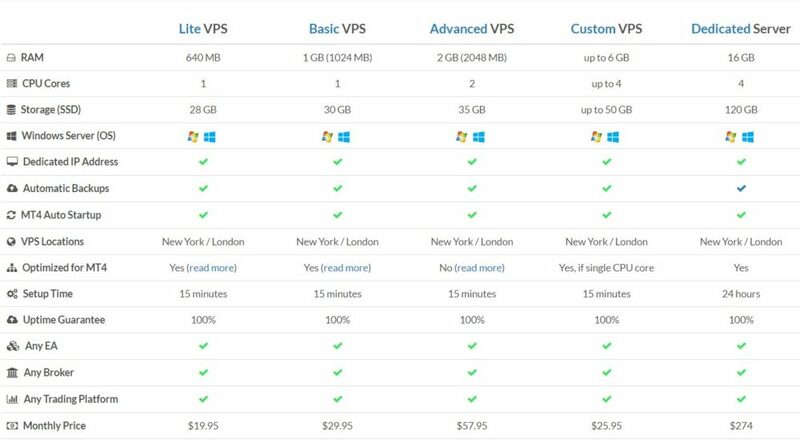 Demo VPS Specifications: “Lite VPS” package. 512MB RAM, 20GB Disk, 1x CPU Core @ 1.7Ghz, Windows Server 2012.. Duration: 5 days.